The Bronx was called Rananchqua by the native Siwanoy band of Lenape, while other Natives knew The Bronx as Keskeskeck. It was divided by the “Aquahung” river, now known as the Bronx River. The land was first settled by Europeans in 1639, when Jonas Bronck, for whom the area was later named, established a farm along the Harlem River in the area now known as the Mott Haven section. The Dutch and English settlers referred to the area as “Bronck’s Land”. In 1846, a new town, West Farms, was created by division of Westchester; in turn, in 1855, the town of Morrisania was created from West Farms. In 1873, the town of Kingsbridge (roughly corresponding to the modern Bronx neighborhoods of Kingsbridge, Riverdale, and Woodlawn) was established within the former borders of Yonkers. In 1874, the western portion of the present Bronx County, consisting of the towns of Kingsbridge, West Farms, and Morrisania, was transferred to New York County, and to New York City; the three towns were abolished in the process. In 1895 the Town of Westchester and portions of Eastchester and Pelham, similarly were transferred to New York County and City. City Island, New York City’s only nautical community, voted to join New York County in 1896. In 1898, the amalgamated City of New York was created, including the Bronx as one of its five boroughs (although still within New York County). 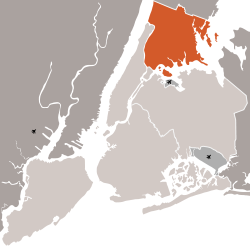 In 1914, those parts of the then New York County which had been annexed from Westchester County in the past decades were newly constituted as Bronx County, while keeping its status as a borough of New York City. After the 1930s, the Irish immigrant population in the Bronx decreased as a result of better living conditions in New York suburbs and in other states. The German population followed suit in the 1940s. So did many Italians in the 1950s and Jews in the 1960s. As the generation of the 1930s retired, many moved to southeastern Florida, west of Fort Lauderdale and Palm Beach. The migration has left a thriving Hispanic (mostly Puerto Rican and Dominican) and African-American population, along with some white areas in the southeastern and northwestern part of the county. 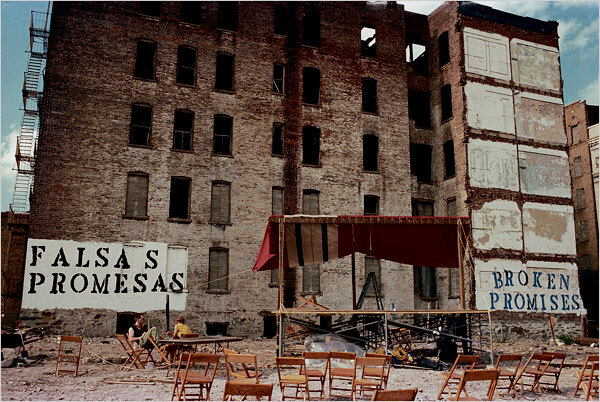 During the mid-1960s to the mid-1970s, the Bronx went into an era of sharp change in the residents’ quality of life. Many factors have been put forward by historians and other social scientists. They include the theory that urban renewal projects in the borough (such as Robert Moses’ Cross-Bronx Expressway) destroyed existing low-density neighborhoods in favor of roads that produced urban sprawl as well as high-density housing projects. Another factor may have been the reduction by insurance companies and banks in offering property-related financial services (mortgages) to some areas of the Bronx — a process known as redlining. For a period, a wave of arson overtook the southern portion of the borough’s apartment buildings, with competing theories as to why. Some point to the heavy traffic and use of illicit drugs among the area’s poor as causing them to be inclined to scam the city’s benefits for burn-out victims as well as the Section 8 housing program. Others believe landlords decided to burn their buildings before their insurance policies expired and were not renewed. After the destruction of many buildings in the South Bronx, the arsons all but ended during the tenure of Mayor Ed Koch with aftereffects still felt into the early 1990s thanks to the infamous crack epidemic. The resurgence in housing has led some single-family homes in the East Bronx to be replaced by multi-family homes. There have been many new apartments built in the Melrose and Morrisania sections of the South Bronx, and near the Grand Concourse, onetime rental apartments are being upgraded and turned into condominiums. As a result, the IRT White Plains Road Line has had an increase in riders. Business chains such as Staples have started stores in the Bronx, and the number of bank branches has increased. In 1997, the Bronx was designated an “All America City” by the National Civic League, signifying its comeback from the decline of the 1970s. In 2006, the New York Times reported that “construction cranes have become the borough’s new visual metaphor, replacing the window decals of the 1980’s in which pictures of potted plants and drawn curtains were placed in the windows of abandoned buildings.” The Bronx Tourism Council’s slogan is “The Bronx is Up”.